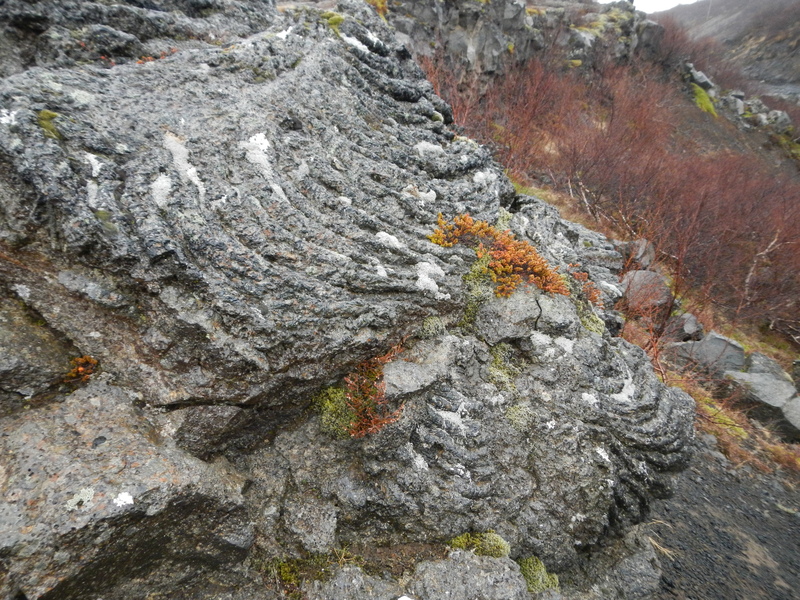 A nice look at a preserved pahoehoe lava flow at the Barnafoss waterfall in Iceland. Note the characteristic “ropy” texture of this more fluid type of flow. We covered quite the distance today – both horizontal and vertical. We started the day with a 1-1/2 hour drive to the Grábrók cinder cone. Nothing like starting the day by climbing an Icelandic volcano! (OK, so it was only a 200 foot climb in elevation.) This cinder cone is approximately 3,000 years in age and is the largest of three volcanic cones along a fissure 600 m (~2,000 ft) in length. Grábrók has been established as a national monument for Iceland. A view looking down inside the crater of the cinder cone. Unfortunately, I could not fit the entire rim in the picture (I had to watch my step – there wasn’t far for me to step back!). 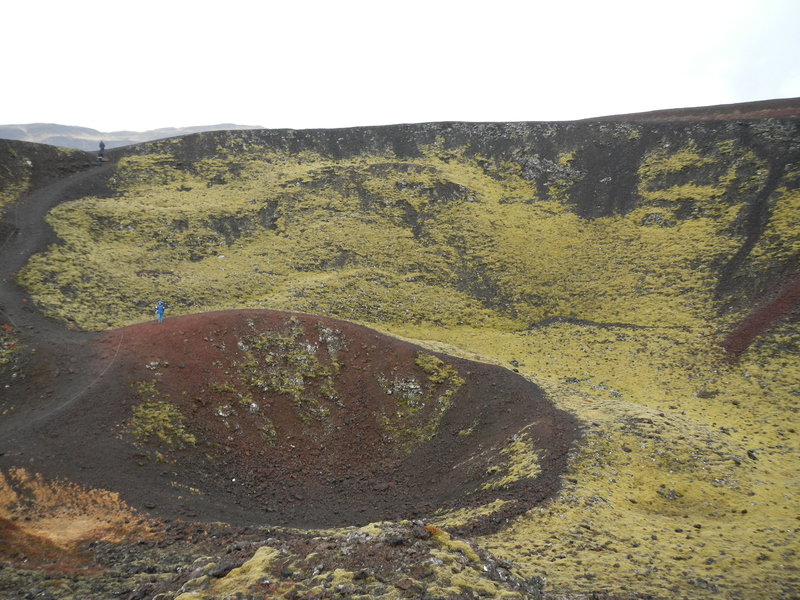 Look at the ring inside the crater for a human in a bright blue jacket for scale. The next stop was to the highest-flow host springs in Europe, Deildartunguhver. The water at this spring is approximately 100 degrees C (that’s 212 degrees F). The hot water is used in area towns and is piped as far as 64 km (~40 miles) away in the longest hot water pipeline in Iceland. We then took an interesting little detour to view a piece of history – the site of the assassination of Snorri Sturluson that took place in 1241 (yes, that year is correct!). 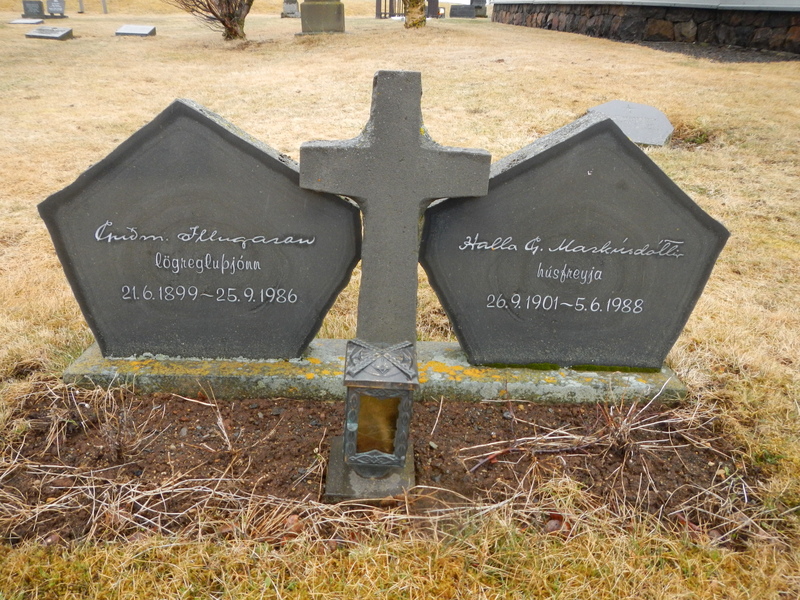 This Icelandic poet, historian, and politician, apparently had a “falling out” with the King of Norway (I’m not sure of all the details – I’ll have to read up on this one). 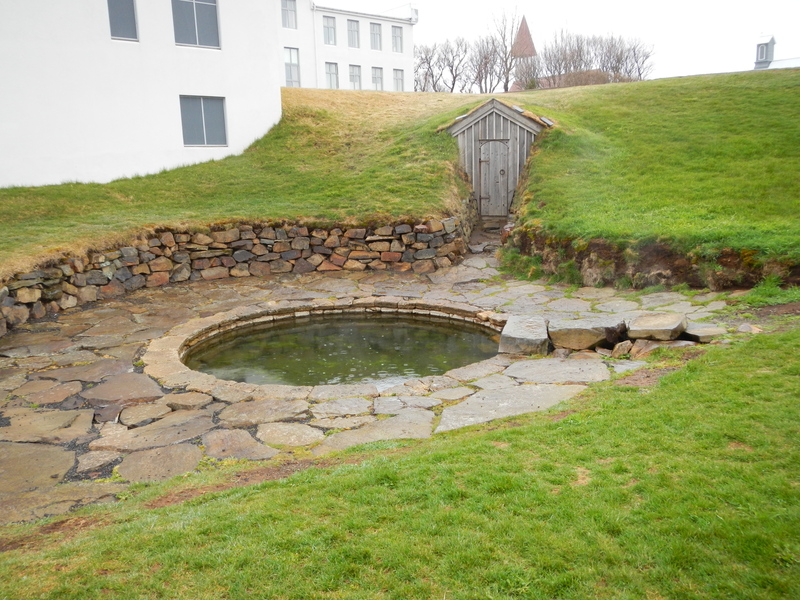 The assassination took place when Snorri was outdoors enjoying some time in his geothermally-fed outdoor pool. The scene of the crime and the end of Snorri. The wooden doorway leads to an underground tunnel that Snorri had built so he could walk from his house to the hot spring indoors, spending as little time outdoors in the cold as possible. Next to Snorri’s home and hot tub was a beautiful old church with tombstones made of – what else – columnar basalt! I wish we had more time to examine the tombstones and other cemeteries. I think I have found a research topic for my next trip to Iceland. Tombstones created from cross sections of columnar basalt in Iceland. 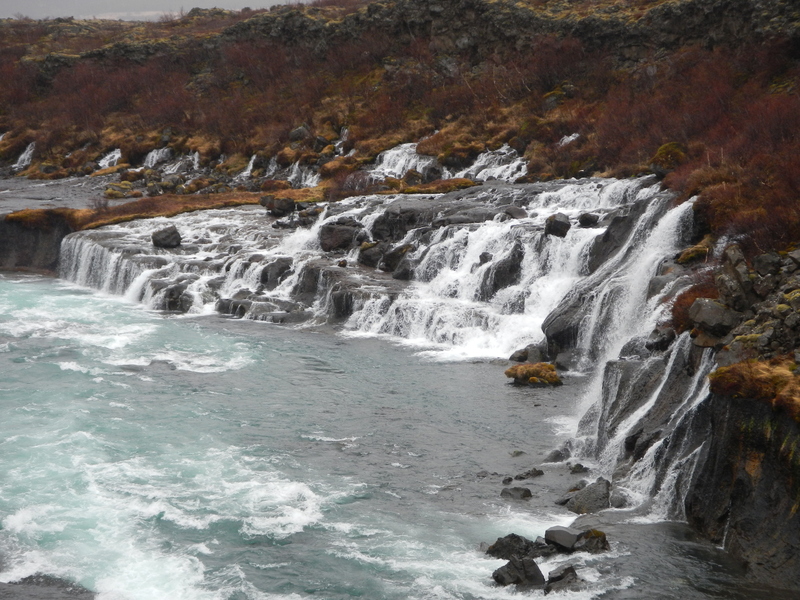 Then we moved on to see two very unique waterfalls that emerge from between overlapping lava flows. The Hraunfossar waterfall is actually numerous springs that is sourced from surface water and glacial meltwater that runs between the layers of lava into the Hvítá River. 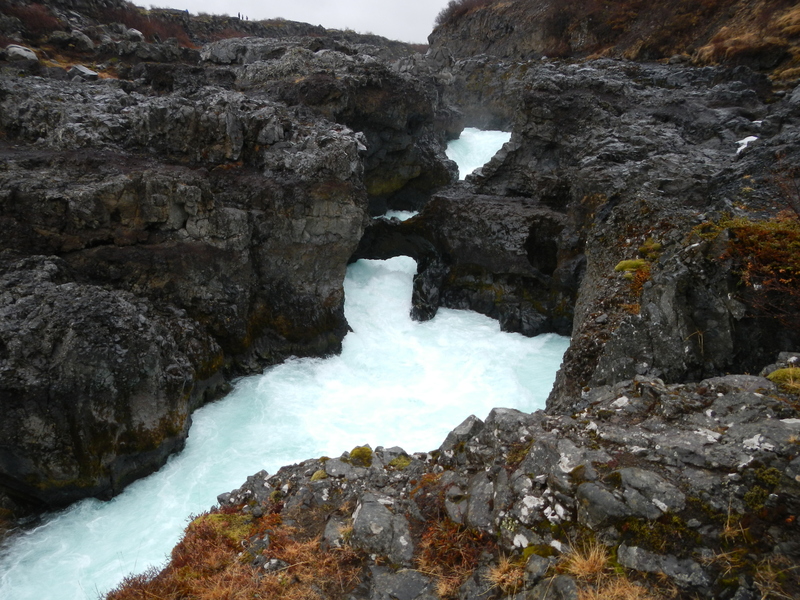 Barnafoss waterfall is a narrow section that causes a higher flow rate, allowing for the rocks to be carved and sculpted. There is a story that two children were killed on Christmas Day while trying to cross Barnafoss over one of these rock bridges, and their mother put a curse on anyone else that tries to cross the river over a rock arch (she destroyed the arch her children are said to have crossed). The volume of water moving through this area, also a national monument, is staggering. Our last stops included visiting an old quarry to examine the rhyolite samples (some people were looking forward to collecting this igneous rock, since we had seen pretty much basalt the entire trip), and visiting the home of our local guide. She was amazing during this trip, helping us learn how to pronounce Icelandic words to making sure we learned something about Icelandic culture while we were visiting and not just doing science. She read Icelandic poetry to us on the bus so we could hear more of the language spoken, and she told us about children’s stories, traditions, and superstitions (did you know that everyone in Iceland believes that elves exist?). Before we were dropped off at the hotels on this evening, she invited us to her home so we could go inside a typical Icelandic home, and she treated us to smoked lamb on a black rye bread. I can’t believe that tomorrow is our last day. Iceland will be very difficult to leave!